Obedience is generally learnt more quickly by a puppy. Always be generous in your praise when your dog comes to you. Praise it even if you have been calling it for some time and it has not come to you and you were angry because it did not obey. A dog must want to come to you because it knows it will be praised and not receive punishment. 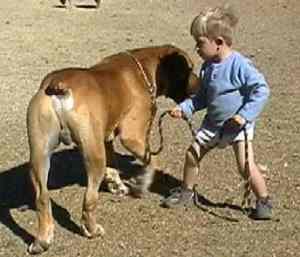 If your dog does not want to come to you, then try putting it on a long lead. Let it run about and then call it. As you do so, pull the dog towards you. Do this without undue force, otherwise you will put it off. Then praise it and be nice to it. Later, let it roam free and then call it from a short distance. The dog will most probably come to you, especially if you squat down when you call it as the dog knows that this is the position you adopt when you are going to play with it. Walking on a lead is another aspect your dog needs to learn. Always lead your dog close to your left foot. Whenever it strains at the lead or tries to run off, give the lead a short, sharp, upwards tug and perhaps accompany this with a sharp reprimand. Your dog will quickly learn how to walk on a lead. If, for some reason, your dog continues to pull at its lead, use a choke chain. This must be put on and used correctly however - with a short, sharp pull upwards which is then released. Remember always to praise your dog when it does something correctly. Additional forms of training for hunting or working dogs are best carried out in conjunction with professional dog handlers. They will advise you on how best to train your particular breed of dog.